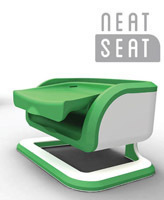 Her winning design, a versatile high chair for infants called the NeatSeat, focused on easy cleaning and adjustability. It was a project for Assistant Professor Ann-Marie Conrado’s Advanced Product Design class. Stachowski, who also won an honorable mention in last year’s competition, says her latest design was inspired both by her engineering internship with Fisher Price last summer and her own family life. Stachowski received a sponsorship from Global Consumer Design to help build the prototype, which cost approximately $12,000. Throughout the process of researching, designing, and creating her prototype, she sought guidance from several Notre Dame professors. “Professor Conrado helped me a ton,” Stachowski says. “I probably wouldn’t have gotten as far as I did without her pushing me a little harder each week. It was great to get her feedback. Sunoh Choe, another senior industrial design major in the College of Arts and Letters, won an honorable mention at this year’s competition for his hassle-free towel-rack extension and bathroom organizer. His design allows towels to dry in a smaller amount of space. To work on their projects, both Choe and Stachowski stayed on campus the week after finals during the fall semester. “It was awesome in the sense that we could bounce ideas off each other,” Stachowski says. “We have a very interactive community in the design major—design is a lot about getting other people’s feedback and opinions. Stachowski and Choe’s awards are the latest in a string of successes for the design program in the Department of Art, Art History, and Design. 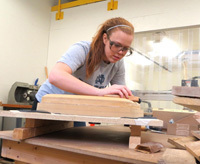 Notre Dame students have won the Industrial Designers Society of America’s (IDSA) Midwest District competition five of the last six years. The winner of this competition is honored at the IDSA annual conference as one of the top five graduating designers in the country. 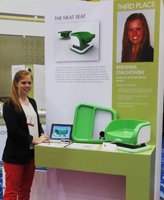 Last year’s IDSA winner, Ryan Geraghty ’12, also won a design award in the IHA student competition as an undergraduate. Originally published by Jonathan Warren at al.nd.edu on April 19, 2013.